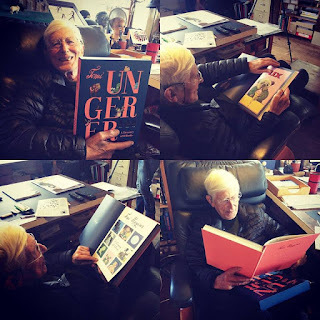 Still mourning the loss of Tomi Ungerer. If you haven't checked it out, read my interview with Tomi from a few years back. :( And the fabulous New York Times obit. Great, great talent. Wonderful life. Anthony Burgess is most famous for having written the novel A Clockwork Orange (that was then perhaps even more famously turned into a movie by Stanley Kubrick). 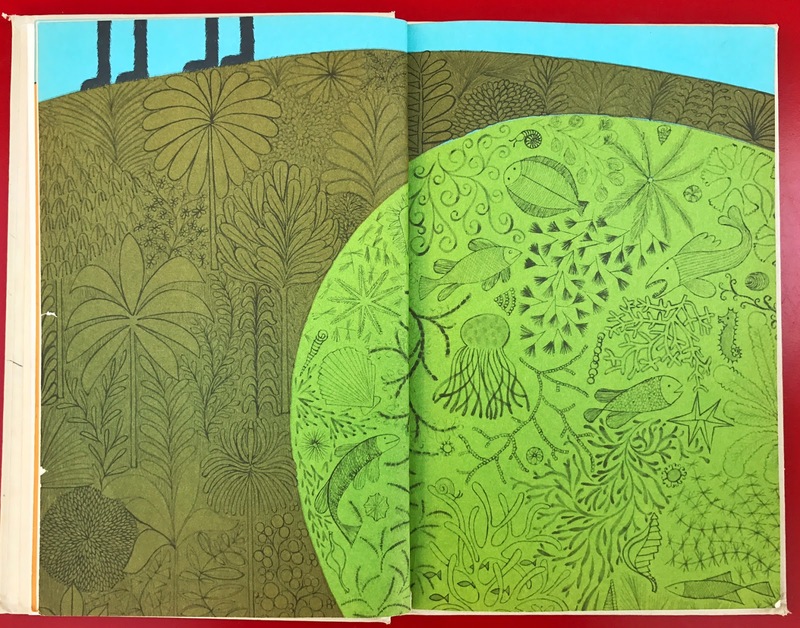 However, it seems that twice he delved into the world of children's books, both to delightful effect. 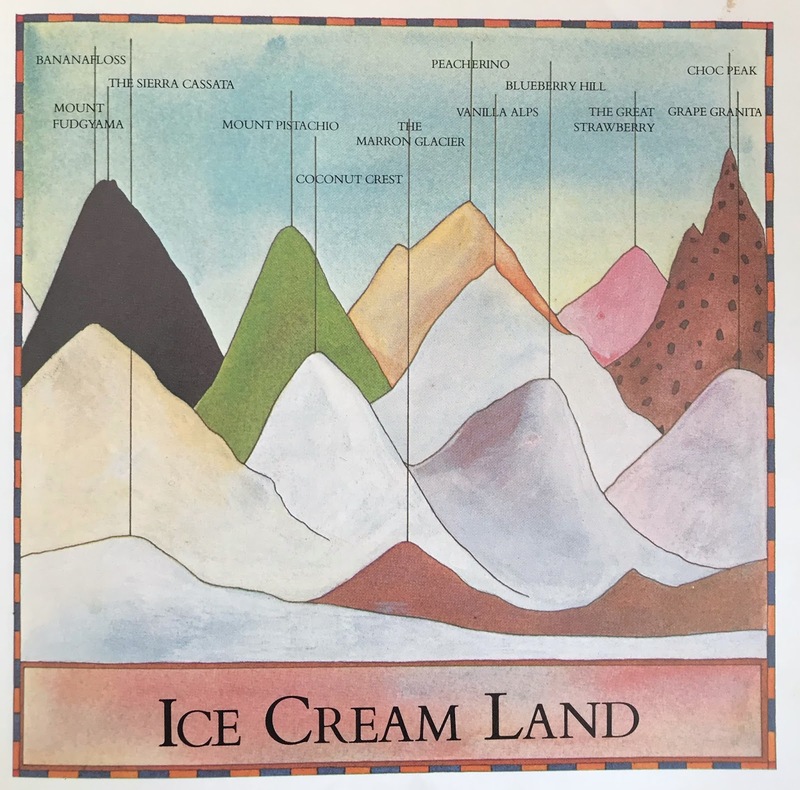 The first, A Long Trip to Teatime, was reprinted by Dover this year with Italian artist Fulvio Testa's original illustrations, but sadly The Land Where the Ice Cream Grows is still out of print. Burgess wrote the book based on a story by Testa, and as you can guess, it is about a world made of ice cream. The story begins like something out of a Wes Anderson movie. Jack and Tom and I were having dinner one day. There was a big, red-faced man sitting alone at the next table, and he'd just finished eating a steak as big as an elephant's ear. The waiter said to him, "Would you like some ice cream now, sir?" The man nearly exploded and said, "Ice cream? I don't want to see ice cream ever ever again!" Naturally, we pricked up our ears at this and we spoke to him. He told us about the land where the ice cream grows and how to find it. 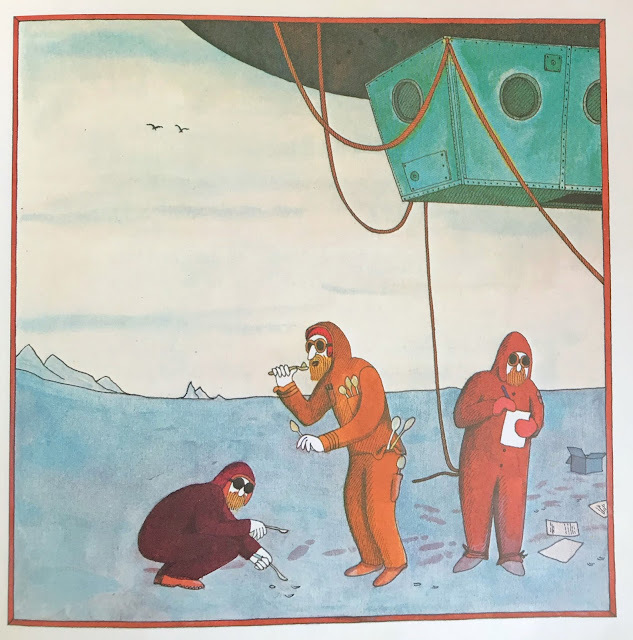 Thus, a blimp is rented for 523 ping-pongs a month, and the two lead an expedition to find this land of the ice milk. 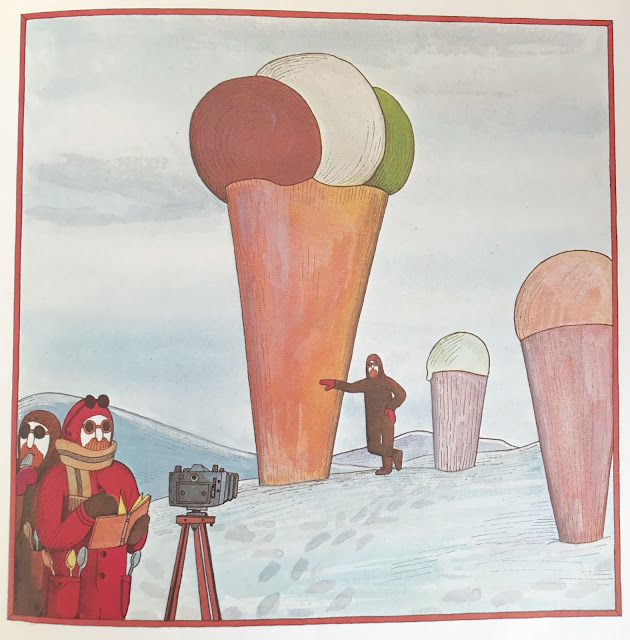 The book is full of flavorful puns that match diary against dairy and desert against dessert and call out the days of the week in eatable (frozen appropriate) fashion. Munchday, Chewsday, Wethersday, Thawsday, Fryday, Shatterday, and (or course) Sundae. You'll notice that we have to wear dark goggles, because of the glare. Were we all going mad, or did we really see what we thought we saw? Because these great big lumps with cherries on top seemed to move, swaying in the ice cream breeze. A terrible thing ice cream. The most terrible thing in the world. 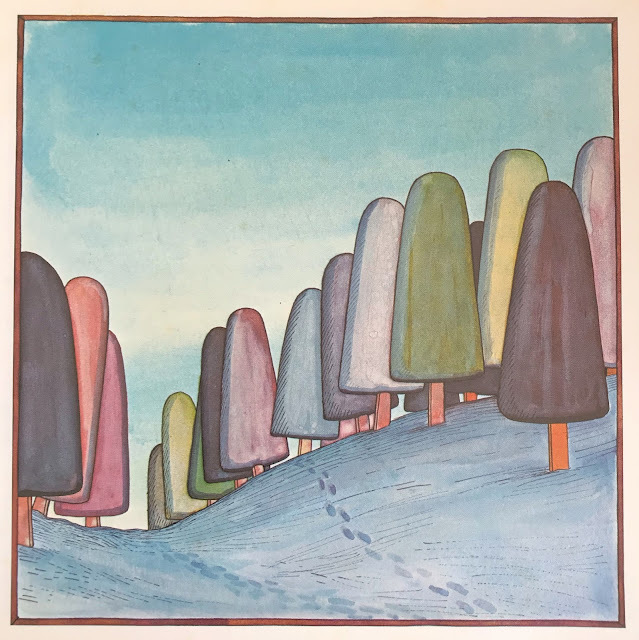 There is a cute twist about Jack and Tom at the end that makes the story even more adorable (as if mountains that mist whipped cream, rivers full of chocolate sauce, giant popsicles and an even bigger, ice cream-eating monster--who can only say one word, Gelato!-- were not enough). A true gem of a book, if you happen upon a copy in the stacks. To get the full story on the collaborations between Burgess and Testa, check out this page of The International Burgess Foundation. It gives the entire 411 on this unforgettable match-up plus a lot on Burgess and Testa's short-print pamphlet (only 180 copies were made) from 1977 called The Christmas Recipe that is in heavy collector demand. 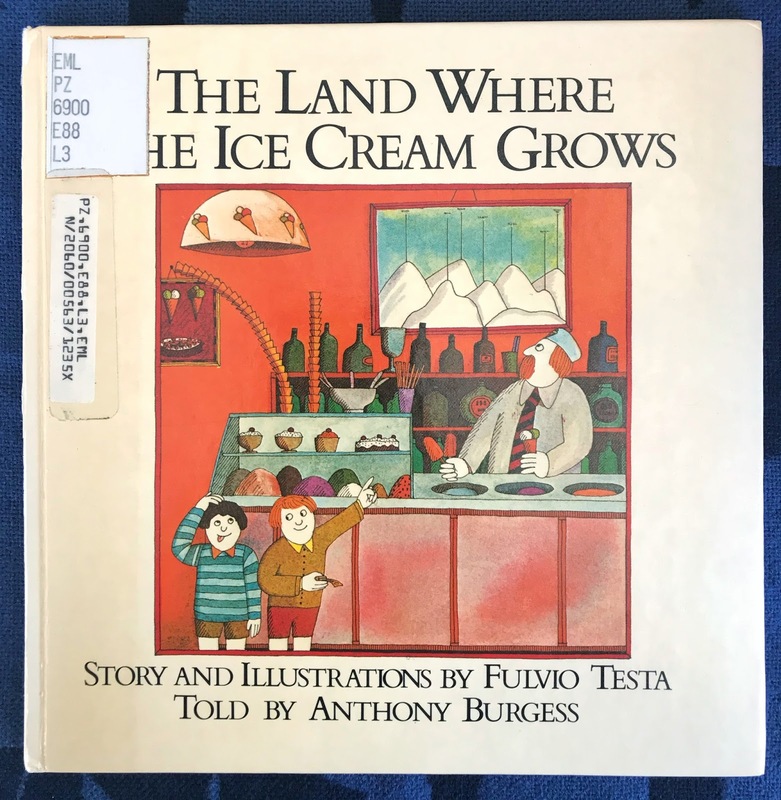 Special moment of linger to the bios in the back of the book where we find that Burgess loves his Dormobile and Testa (surprise) loves ice cream. Over the next few days I am going to be culling the herd to make way for new Christmas books, so I am reviving my Etsy shop for a small window of time. 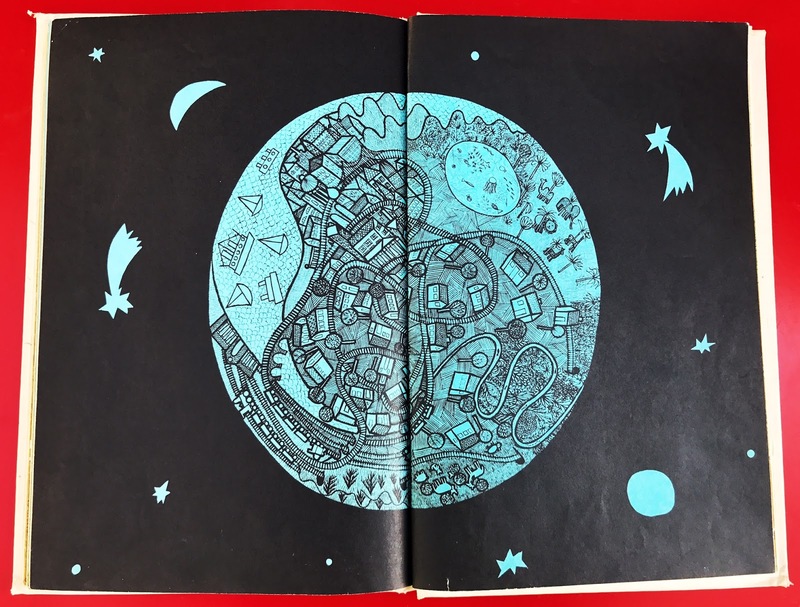 The Story of Zachary Zween by Mabel Watts and Marylin Hafner; for sale here; reviewed here. Quick by Remy Charlip and Burton Supree; for sale here; reviewed here. Allumette by Tomi Ungerer; for sale here; reviewed here. 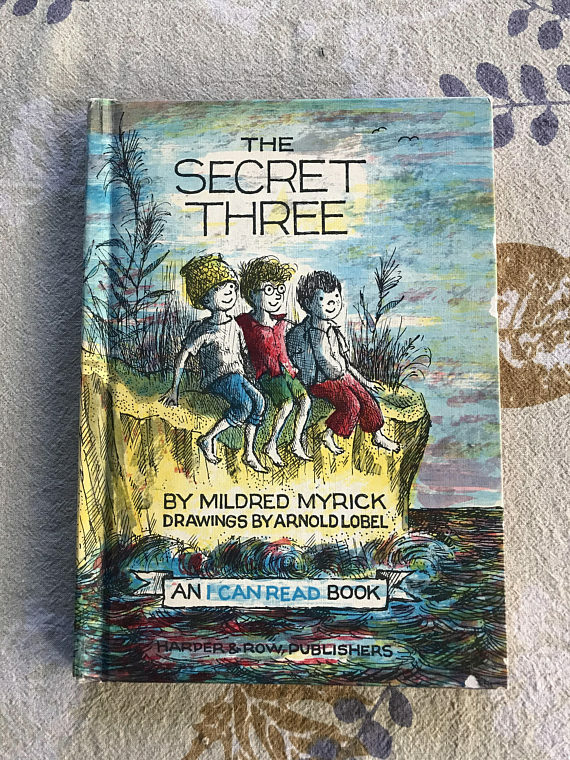 The Secret Three by Arnold Lobel and Mildred Myrick; for sale here; reviewed here. Check out the full store here and keep your eyes peeled in the days to come. Grandpa's Ghost Stories Back in Print! 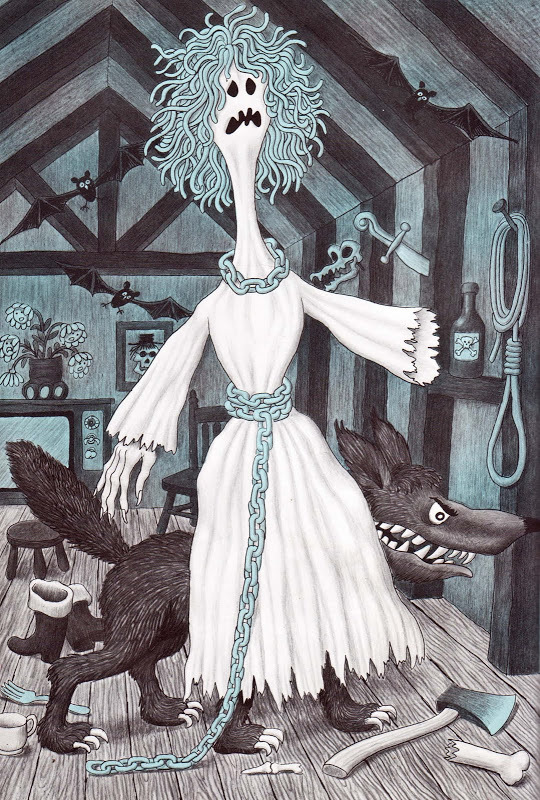 Just poking my head in to say Jim Flora's Grandpa's Ghost Stories is back in print from Feral House Press. Happy happy day! Still THE spookiest of all the children's books ANYWHERE! You're welcome. Original post here. 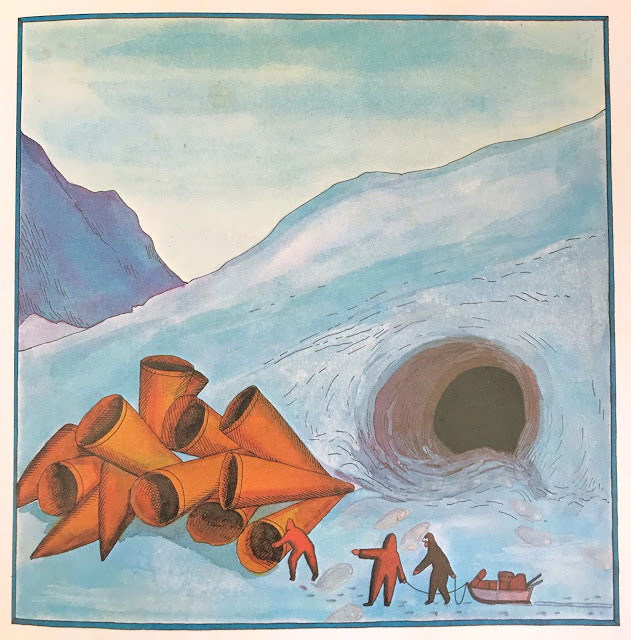 Rising from the grave here because I am just past spring break and shelves were cleaned off, and I was reminded of just how many books there are still to share. Every time I turn around, a beloved author is passing away; their books like tiny secrets lost in time. There will be great authors who will live forever like Seuss or Margaret Wise Brown, but for every one of those there are a thousand others who fade from view. Their wonderful spirits vanished to the bins at Goodwill, or worse, withdrawn and thrown away. 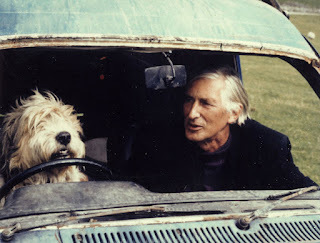 This summer it will be ten years since I started this blog. So much has happened in that time. 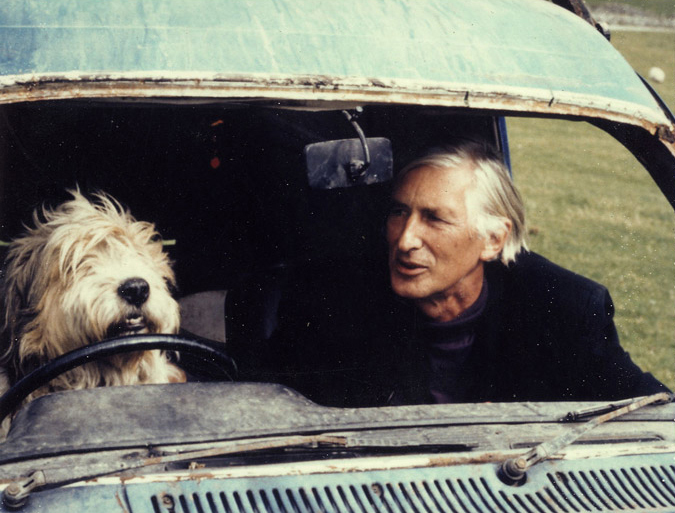 Publishers have taken more of an interest in out-of-print books that begged to be reprinted. Used booksellers have gotten more savvy about what people are willing to pay for old, beloved favorites. The internet has made it easy to price books accordingly, so that even the shelves of my favorite thrift stores are filled with overpriced gems. Gone are the days of 25 cent classics and incredible finds. Gone are the days when no one was shopping the book section at my local flea market. San Antonio, like many other American cities, is much too hipster for all that now. Sadly, that was what made this blog so easy to begin with. 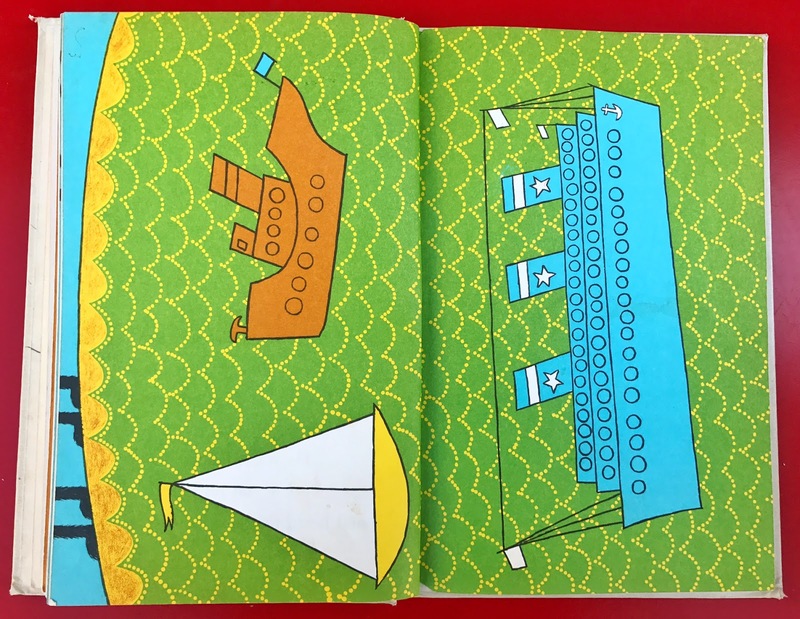 All I needed was a five dollar bill, a son who loved being read to, and an imagination open to looking beyond dingy library binding. It helped that I had a best friend who shared my passion for old children's books and had an even more amazing collection than my own. I couldn't start this blog now without a much larger budget and more time to pick over and buy premium Etsy scores. All the fabulous out-of-reach design things moms like me pined for ten years ago are now being knocked off and sold at Target for a fraction of the cost, and all the vintage treasures that were so bountiful and inexpensive have been discovered and driven up in price. My son has moved on from picture books for the most part defaulting to his obsessive audio book collection, graphic novels, and middle school required reading like Shiloh (in Spanish) and Walk Two Moons. My BFF moved back to New York and now stretches past kids' books to troll library sales and handpick vintage design books for resale, and I went back to work in publishing. The end result being little to no time for this hobby right here. But somehow, I always return. This spot reflects the hours I spent cross-legged on the floor with my son taking him to far off lands and introducing him to monsters who dance wild on islands and children who learn to switch on the night. This is the place where we met a fox who was indeed fantastic and spied on three robbers who befriended an orphan girl. This corner of the interwebs will always be the sacred space where I held my son in my arms squirming and squealing... "Again again, Mommy. Read it again." Every book on these pages is a memory of the best years of my life. I will cherish it always and mourn those moments when it was just me and him and all we wanted was the perfect 32 pages and all we had was all the time in the world. Books are everything. With all that is wrong with the world, we were lucky enough to get lost in them for a while. That said, Four Fur Feet popped into my view this last week and had me grieving again for the loss of Remy Charlip, lamenting the publishing urge to always re-illustrate, and falling in love again with the words of Ms. Brown. My son might be growing up, but I'll always come back if I find something worth remembering. 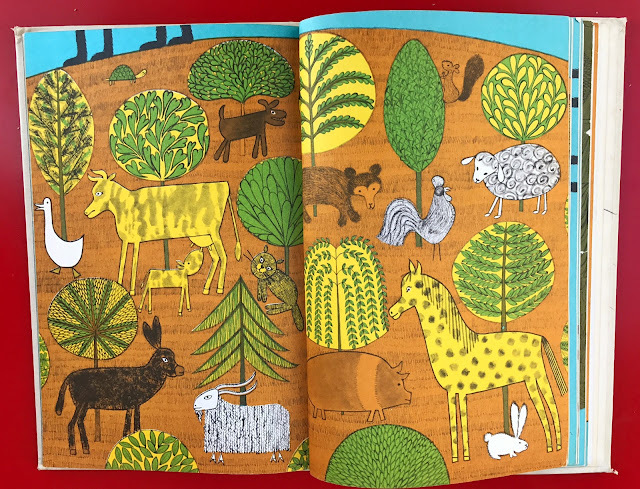 What makes this book incomparable, ingenious, and absolute magic is that you never see the animal depicted in these pages. We only see his feet. His fabulous four fur feet! 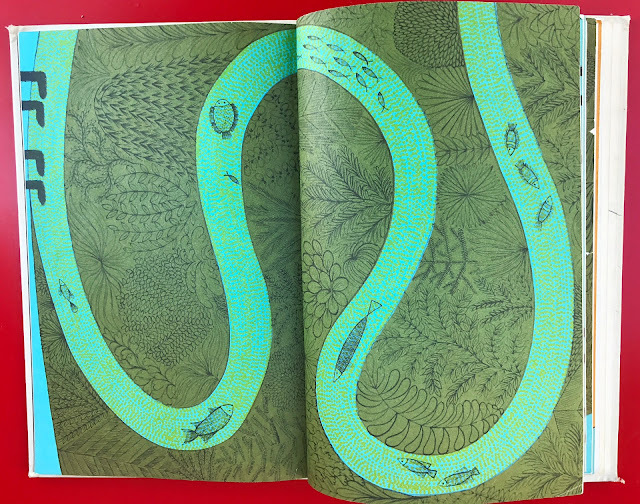 around the pages of the book. has gotten part way around the world. It is plays on the form like this that made Charlip such a delightful illustrator and a true artist. Simple. Playful. Elegant. And absolutely silly. 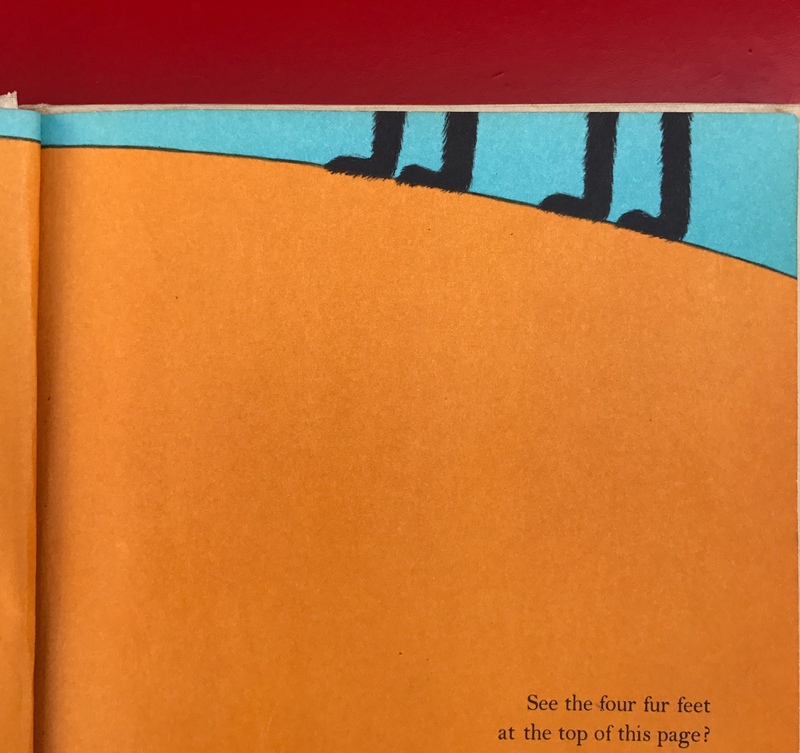 The feet appear throughout the book as if they are actually walking around the world until at last our creature sets down to rest and dream. Rising from the dead here to post this little tidbit from Tomi Ungerer's social media feed. 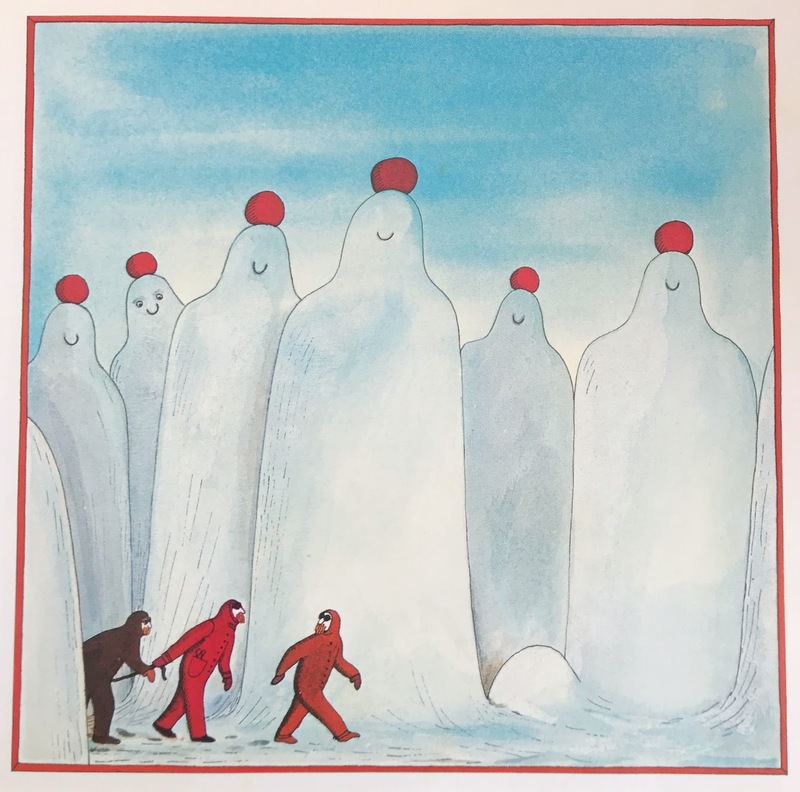 Phaidon is releasing a single slipcased volume of eight of Tomi's newish and classic books, The Three Robbers, Moon Man, Otto, Fog Island, Zeralda's Ogre, Flix, The Hat, and Emile. Psyched! And in case you missed it a million years years ago, travel back in time to my interview with Tomi himself! 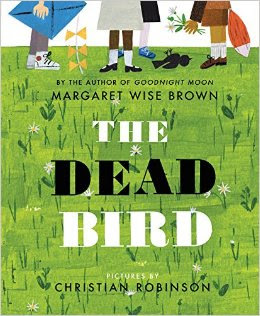 Personal fave The Dead Bird by Margaret Wise Brown has been released by HarperCollins with new illustrations by Caldecott-winner Christian Robinson. Remy Chalip's original illustrations for this classic on love and loss will always be the best to me, but I do delight when a book that's been lost to generations of children gets reinvented so it can be loved once again. And Robinson is obviously skilled for the task. Other awesome books by Charlip include Thirteen, Arm and Arm, and Mother Mother I Feel Sick Send for the Doctor Quick Quick Quick. 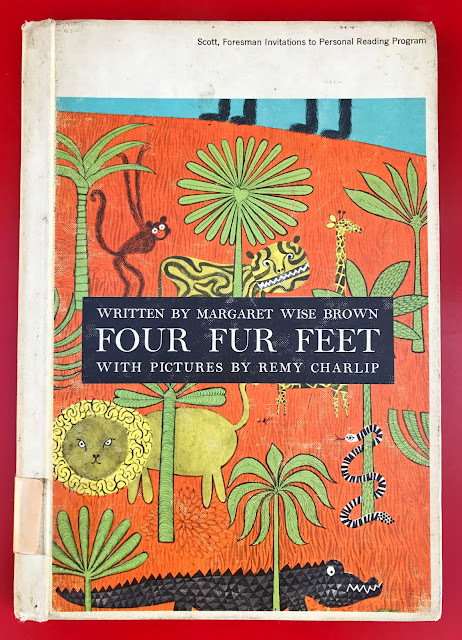 And maybe Margaret Wise Brown really will live forever. Wouldn't that be something? If you can get your hands on the December 2000 issue of Vanity Fair, there is an article about Ms. Brown that is spectacular! Not to be missed.